There is absolutely no way to win real money regularly playing Pai Gow poker without knowing the rules. The number of casino games that can be won on just luck is high but unfortunately, this double-hand poker game is not one of them. Players have to use skill to make sure they win. It is the use of skill to win the game that has made the game popular in Mzansi and Other African countries. The rules of Pai Gow poker are an essential part any successful gambling strategy. Without knowledge of the rules, it is as good as trying to navigate Johannesburg without GPS or a Map. You might get to where you want to go but there is a great chance that you will end up in hostile territory where losing money becomes inevitable. The game is played with a standard deck of 52 cards with an extra card, the Joker, to make the size of the deck 53 cards. The Joker is described as a semi-wild. This is because it will help complete a straight, flush, straight flush or a royal flush by acting as an Ace. When the player places a bet the game begins. At the start of the game, the dealer will deal 7 cards each to the player and himself/herself. The 7 cards are split into two hands. A high hand with 5 cards and a low hand with 2 cards. As the names suggest the high hand has to have a greater value than the low hand. Hands are compared like to like. The two card hands together and the 5 card hands together. When both player’s hands are higher than the dealer’s hands the player wins. In the event, that there is a tie the bet pushes. 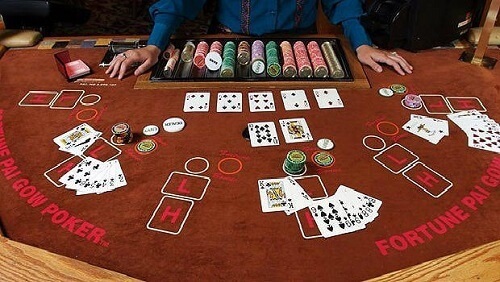 However, when the dealer’s hands have higher values than the player’s hands the bet losses. All winnings are subject to a 5% house commission. Players can select to play as the banker or bet against the banker. This is a unique feature in this game. The role the Banker may rotate around the table and a player can decline or quit being the banker at any time. Learn about more popular table games with Casino ZA.